A technique used at a school for the arts can foster independent learning in other subjects as well. A student who is able to accurately and effectively self-assess, then revise accordingly, has attained independence as a learner. This is the goal of New Mexico School for the Arts (NMSA), a dual arts and academic curriculum: to create independent, self-sufficient, and lifelong learners. NMSA teaches structured critique in each of their arts departments (dance, theater, music, and visual arts), developing their students' ability to assess and revise their work within arts, academics, and beyond. 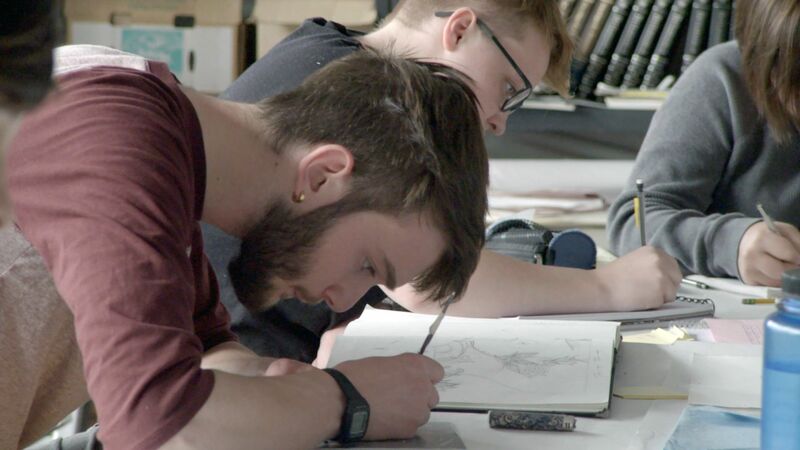 "My goal as a teacher, in regards to self-assessment," says Karina Hean, the chair of NMSA's visual arts department, "is to get students to a place by 11th grade where they can visualize what needs to adjust and be their own editor. Until they can do that, they're always going to rely on outside voices, which isn't bad in and of itself, but you often need to be your own problem solver." If you want to develop your students' ability to self-assess, you can adapt NMSA's three-step process in your classroom, as well as their practices -- from Post-it note critiques to Visual Thinking Strategies. In order to create great work, students need to know what great work looks like. "Then the teacher has an obligation to speak to what makes that work great in a very specific way," says Cristina Gonzalez, the former chair of NMSA's visual arts department. In English, you can show your students an example of an exemplary essay. If you're having a Socratic discussion, you can review the guidelines for a great discussion. School 21, a London-based public school, performs live demonstrations and shows prerecorded videos of teachers having conversations to demonstrate exemplary discussion techniques. Whether talking about syntax, tone, grammar or wiping, burrs, and mezzotinting, your students need to know the vocabulary specific to their craft to assess their and other's work. "To give feedback, it can’t just be the way you feel about something," says Cindy Montoya, NMSA's principal. "That feedback is based on some technical knowledge about their specific art." The NMSA dance department lists vocabulary (like canon, plié, and tendu) on a board, and students are tested on that vocabulary. The drama department displays phrases on the wall that help guide their peer critique. Pointing students to "The angel didn't fly" or "You broke the moment" reflects that a scene ended before the students effectively communicated what they had intended. Within a department, whether English, science, or drama, ensure that all teachers use common critique language. "We have a common language," says Joey Chavez, the chair of NMSA's theater department, "and that's purposeful. We -- all four instructors -- want to give them feedback with the same language." By doing this, your students build on the same vocabulary as they move through a department from year to year. Peer critique gives your students an opportunity to use and share their voice, and it helps them to become more receptive to hearing and using feedback. "They're more prone to listen to the voices of their peers," says Hean. "It's also beneficial for them to verbalize and write their ideas out, to make them succinct, get them clear, and realize when they're not clear." It's important to remind your students of the purpose of a critique: to learn and improve their work. When they agree that the purpose of a critique is to improve their work, they become more receptive to feedback because they know it will help them. A verbal agreement will also help your students become more comfortable with giving constructive criticism. "Compliments are nice, but they don't push you forward," says Hean. She describes how, by having them create that verbal contract, "you're giving them a chance, from their own motivation, to make sure that they'll respect that agreement and help each other." When your students are critiquing, they may use a word like "boring" to describe a piece of work. Words like that are vague and can be taken personally. "If you have a student say, 'Your print is really boring,' or 'Your drawing is really boring,' that could mean so many things," explains Hean. "What are they seeing? Help your students dig deeper into what's going on with the design, and help them to go beyond that surface terminology." "Critiquing and speaking out loud about your own work or someone else's work is very intimidating," adds Hean. "And to say it in front of your peer group that you see every day is maybe even more so because there is an accountability there." To help build your students' comfort and confidence around sharing their opinions, have them write their critique first, and then read it aloud. This practice can remove the discomfort of not knowing what to say, and it can help students discover what attracts them to a piece of work if they don't yet know how they feel about it. "The key for each student is to realize that they have a valid, strong opinion, and that they can articulate that opinion to one another," says Hean. "That's part of this job -- coaching that confidence into being. You help them sentence by sentence to get to a place where they have trust in their own thoughts." Before they come to NMSA, the majority of incoming ninth-grade students know that they do or don't like something, but they don't always know why. "We try to help them uncover what that is -- why something in a composition or design is working, and why something else is not," says Hean. By focusing critiques around specific topics -- like technique, concept, or craftsmanship -- and guiding them with specific questions, you can help direct your students' critique, develop their language, and deepen their understanding of why something does or doesn't work. Facilitate a discussion around the feedback. "Let that feedback generate more questions, more responses, and remind your students that this is a conversation, and that conversations evolve," suggests Hean. "They're not right or wrong. That tends to give your students an opportunity to not take any one response too seriously. There's so much more absorption that goes on when the ideas are shared through conversation." After a critique, summarize what your students said. When restating the critique, use different words so that the student receiving the feedback can hear it in an alternate way, giving him or her an opportunity to absorb it more deeply. "Students will start by describing what's in the painting, like, 'There's a man standing by a horse, and it looks like there's somebody falling on the ground.' Then they'll start saying, 'It seems very dark to me, almost threatening.’ There's an interpretive element," says Gonzalez. Once they start analyzing what they see, they can then judge whether specific elements add or take away from the painting -- or print, sculpture, or even essay. Post-it note critiques -- a one- to three-word written critique on a Post-it note -- allows your students to move around and give brief feedback on multiple works without having to verbalize their opinion. Post-it note critiques can be a great way for timid students to build confidence around sharing their opinion. These critiques also help students practice their interpretation and analysis skills. "Each person gets to respond with a word or phrase concisely on each print to get their engines going about how imagery, value, mark, and composition communicate concepts and ideas," explains Hean. "It guides them to go deeper." 1. Arrange your students' work around the room so that each student can walk around and have the space to critique each piece. 2. You'll need a lot of Post-it notes. Each student needs a stack of Post-it notes to match the number of peer works that that they'll be critiquing. 3. Keep the critiques brief -- one to three words. 4. Share a clear critique goal with your students. "I tend to use Post-it note critiques when I have a specific interpretation or specific question about technique to ask so that they get to answer quickly, and they don't beat around the bush with it," says Hean. 5. Have each student gather their Post-it notes and read through them so they can then apply the feedback to their work. "The students get brief, concise, very direct communication. It's not contaminated by a student delivering it in a less clear way," says Hean. The fishbowl is a form of Socratic discussion that allows your students to reflect on, critique, and then build upon their peers' discussion. Before you jump into a fishbowl discussion, discuss its purpose and share the protocols and guidelines with your students. Not interrupting, respecting your peers (even if you disagree), and "knowing that the goal is to ask questions, not to develop answers" are some of those guidelines, says Geron Spray, an English and world history teacher. Split your students into two groups. One group begins the discussion, while the other group sits around them, listens, and critiques them. The students who are listening critique those who are discussing based on the content of what they discuss, along with how well they follow the protocols. "Are they making eye contact?" asks Spray. "Are they referring to the text as evidence? Are they asking questions? Are they including other people in the discussion?" Have your groups switch. The students who were talking take on the role of listening, and those listening can now build on the discussion of the students before them. "The goal is that the second round of discussion will be more in-depth," says Spray. "The group now discussing has had five, 10, 20 minutes -- however much time -- to really give a lot of thought to what is being said and how it's being said. It's an immediate assessment of the students' work, and the second group of students can build on the success or lack thereof of the first group." Whether you're dancing, acting, painting, writing, or composing music, you're constantly assessing and revising your craft. It's part of the artistic process. "There is a looseness to creating something," says Hean. "It doesn’t quite hit the mark, you revise, you reassess, you go at it again. That’s our constant working method. No matter what they’re doing in any walk of life -- whatever job, whatever engagement, whatever relationship they’re having -- that ability to self-assess is there." Demographic data is from the 2016-2017 academic year. Financial data is from the 2013-2014 academic year.